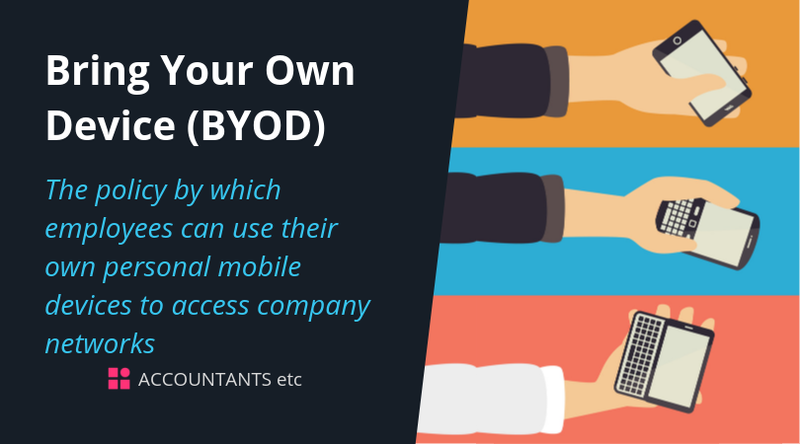 BYOD refers to the policy by which employees can use their own personal mobile devices to access company networks/systems. Some employees will often prefer to use their own personal mobile devices to access company networks/systems. However, this is potentially a security loophole which places the organisation at risk from reputational damage and legal proceedings. Firms need a policy which sets out the devices which may or may not be connected to a firms’ network; procedures to ensure that non-approved devices can never be ‘accidentally’ connected; and appropriate mechanisms in place to maintain security over personal data which may be stored on mobile devices. There is a high risk that confidential corporate and client data can find its way onto personal devices – which are usually not very secure and can be easily lost/mislaid/stolen. Imagine the scenario, an employee receives an email with an attachment containing a mailing list of all clients and their contact details which they open and save onto their mobile device. If that device then goes missing the data stored on it could find its way into the public domain, or be mis-used, or sold onto a competitor. What’s worse is that the ICO will need to be notified of the loss of data, as will each individual on that mailing list. This can cause major reputational damage as well as a large financial penalty. This allows any device to be ‘plugged in’. This approach is entirely opposite to zero-tolerance and allows any device to be ‘plugged in’ at any time. Advantages are a) for the employee who is not restricted by device, and b) for the company which does not have to keep updating a list of approved devices. Most current versions of network operating software (Windows and Mac) have inbuilt security tools which can be used to maintain a list of 'approved' devices. A more expensive way of providing device security is to use MDM services – these may either be provided as part of the network operating software, or this service may be provided by a third-party. There are different levels of this type of service ranging from simple registration and device reset services, to sandboxing personal and corporate data – which will allow separate wiping of corporate data only. Storage media – the firm may want to specify the approach with regard to memory/SD cards. Opt-out - Decline to sign-up for the BYOD policy – in which case the employee will not be able to use any personal devices for work. Opt-in - Agree to sign-up for the BYOD policy – in which case their device will need to be registered on the network and also, if applicable, with a mobile device management service. Make appropriate network infrastructure security changes and procure any additional services (such as MDM). Decide if additional security is required such as data encryption tools. Define and communicate a date for implementing the policy. Implementing a BYOD policy and training staff.